Victor Romero vs. Brian Bogue. Photo by Mariya Stoyanova. Joe Logan (right) vs. Jared Tipton. Photo by Dan Eric. Professional WBC Full Rules International Challenge Championship, 5×3, 137 lbs. Deividas Danyla (Team Toro Janjira from Lithuania by way of Chicago) def. Rami Ibrahim (Rami’s Elite from Palestine by way of Philadelphia) by TKO at 1:08 of Round 2. Professional WBC Full Rules, 5×3, 130 lbs. John Nofer (Rami’s Elite in Philadelphia) def. Amine Ballafrikh (Capital MMA from Morocco by way of the Washington, D.C. Beltway) by TKO at 0:46 of Round 4. Ariel Abreu (Camp Undefeated in NYC) def. Sean Woodham (The Institute in New Jersey) by KO at 1:10 of Round 1. A-Class Amateurs, 5×2, 126 lbs. Joe Logan (Stay Fly Muaythai in Philadelphia) def. Jared Tipton (Level Up Boxing in Maryland) by Unanimous Decision: All Three Judges 48-47. A-Class Amateurs, 3×2, 178 lbs. Brian Hansen (Five Points Academy NYC) def. Paul Banasiak (Thornton Martial Arts – Sityodtong in Connecticut) by TKO at 1:10 of Round 2. A-Class Amateurs, 3×2, 133 lbs. Adam McCann (Body Arts Muay Thai in Philadelphia) def. Youyung Cho (Kings Combat Fitness NYC) by Split Decision: 30-28, 29-28 and 28-29. A-Class Amateurs (No Elbows), 3×2, 165 lbs. Victor Romero (Strategic Combat Academy) def. Brian Bogue (Burke’s Martial Arts Rhode Island) by Split Decision: 30-27, 29-28 and 28-29. A-Class Amateurs, 3×2, 150 lbs. Chanon Kuldraree (C3 Athletics Connecticut) def. Kevin Sanchez (The Wat NYC) by Unanimous Decision: 29-28, 29-28 and 30-27. A-Class Amateurs, 3×2, 140 lbs. Rich Stambach (AMA Fight Club in New Jersey) def. Ethan Geffen (Queens MMA in NYC) by Split Decision: 30-29, 29-28 and 28-29. B-Class Amateurs, 3×2, 140 lbs. Henry Lee (Kings Combat Fitness NYC) def. Stergos Mikkios (Thornton Martial Arts – Sityodtong in Connecticut) by Unanimous Decision: 30-27, 30-28 and 29-28. B-Class Amateurs, 3×2, 150 lbs. Jermaine Palmer (North Jersey Muay Thai) def. Vinny Melillo (Serra Longo Fight Team on Long Island) by Unanimous Decision: 30-27, 30-28 and 29-28. Mike Gallagher (Iron Wolverines in New Jersey) def. Malcolm Hill (The Institute in New Jersey) by Split Decision: 30-27, 29-28 and 28-29. B-Class Amateurs, 3×2, 125 lbs. Sam Santiago (Square Circle New York) def. Jack Hu (The Wat in NYC) by Split Decision: 29-28, 29-28 and 28-29. B-Class Amateurs, 3×2, 145 lbs. Manny Reinoso (Serra Longo Fight Team on Long Island) def. Chris Bartolino (Iron Wolverines in New Jersey) by Split Decision: 29-28, 29-28 and 28-29. Chris Berrocal (Impact Martial Arts Academy in New Jersey) def. Ray Kwan (Five Points Academy in NYC) by Unanimous Decision: 29-28, 29-28 and 30-27. Adam McCain (right) vs. Youyung Cho. Photo by Dan Eric. 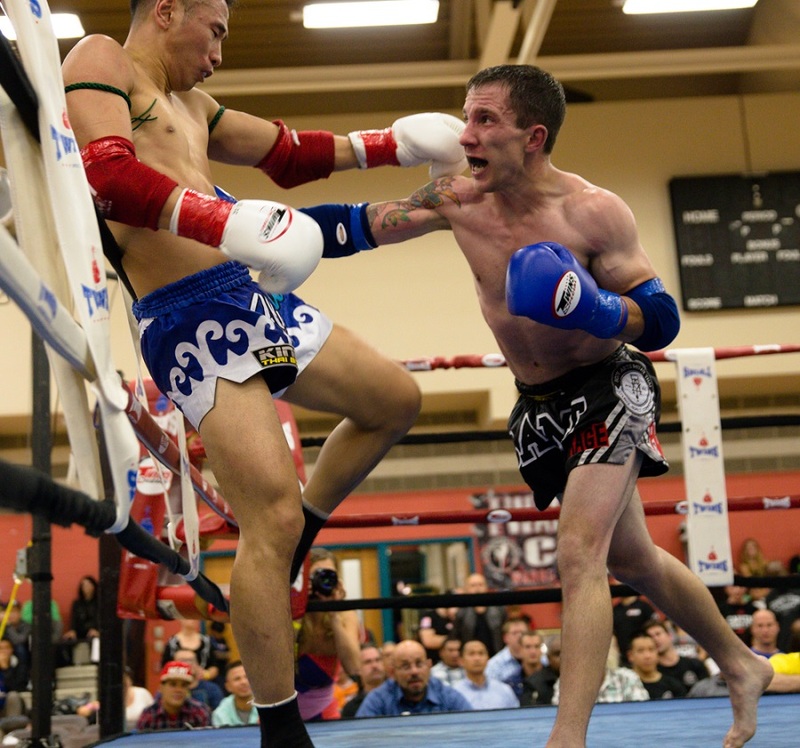 This entry was posted in News & Results and tagged featured, Muay Thai, New Jersey, Warrirors Cup. Bookmark the permalink.